Dale W. Berry is a commercial artist and designer, graphic novelist (see the Tales of the Moonlight Cutter series), and the founder of Myriad Publications. In December 2015, AHMM published his “Not A Creature Was Stirring,” the first graphic short story ever to appear in the magazine, and in the current issue (March/April), we published a second, his suspenseful “Dead Air.” Here he talks about that story, and how graphic storytelling and the mystery genre work together. Sometimes I think the process of creating graphic short stories—of telling a tale visually on the page as well as in written words—is like having to do the same thing every writer does, but times two. You imagine the plot and characters, maybe a certain sequence or relationship, and then conjure the words to describe them. You live and breathe and compose them into existence. Difficult enough, even in the best of situations. But then, somewhat ridiculously, you must do it all again, in sketches and thumbnails, in pencils and inks, and graphics and print production. In the end, though, it’s worth it. Because that fusion of words and pictures, laid out in sequence like movies on paper, connects in the reader’s mind differently than words alone. And that’s always been the real magic of “comics.” They can float a global corporate film franchise, sure, but they’ll also take you into your most private space. There’s really no great, cosmic backstory necessary. For me, that’s why creating them in the mystery genre makes sense, especially in short form. Graphic storytelling can capture a moment. Arranging and re-arranging that sequence of little pictures evokes mood, atmosphere and motivation. It allows you to examine an intimate human drama, building and dissecting conflict and suspense, beat by beat. You go deeper. And the mystery genre does the same thing. The two forms were made for each other. If I’m wrong, then Alfred Hitchcock never storyboarded the shower scene from Psycho. For “Dead Air”, in the latest issue of AHMM, I drew (pardon the pun) on my 25+ years as a radio disc jockey to tell the kind of intimate story that mysteries and comics both do well: the isolated protagonist is confronted with a potential life-or-death puzzle, and must solve it while the clock is ticking. It’s a classic set-up. It’s also classic live radio . . . you can ask any disc jockey. God forbid you let “dead air” happen, even as somewhere out there a listener is connecting with you in an immediate and intimate way. 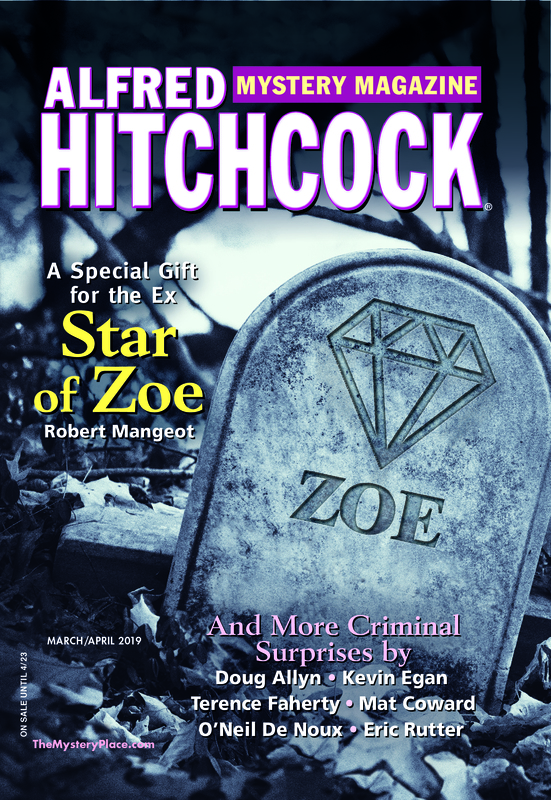 Alfred Hitchcock’s Mystery Magazine passes a milestone this year as we celebrate our sixtieth anniversary. You’ll see to the right the special cover we commissioned from Joel Spector for our January/February issue. The magazine debuted in 1956, capitalizing on the fame of director Alfred Hitchcock and his association in the popular mind with the mysterious and macabre. The television show Alfred Hitchcock Presents had reinforced this association when it began in 1955, but we have now out-lived the TV show by decades thanks to the creative fecundity of our authors and to the loyalty of our readers: your appetite for murder and mayhem appears to be endless. Though now eligible for AARP membership, AHMM still strives to keep up with the times. We maintain a lively Facebook presence, where we have lately been posting classic covers from past issues, and if you haven’t yet checked out our podcast series on iTunes and Podomatic featuring authors reading their stories, I encourage you to do so. And even after threescore years, we’re still looking to try new things. Our January/February issue also features our first-ever graphic short story, “Not a Creature Was Stirring . . .” by Dale Berry. Over the course of the year, we’ll be looking for other ways to celebrate our sixtieth anniversary. But most importantly we will continue to do what has gotten us this far: Bring you, month in and month out, the best mystery and crime short stories from both new and established authors. Thank you for sixty years of support, and here’s to a delightfully criminous 2016!